Its Friday and I was in a mood to have something sweet for breakfast. If you have been reading my blog regularly you would know one thing about me is that I love sweets :)I’m already in a weekend mood and finally decided to bake some muffins. 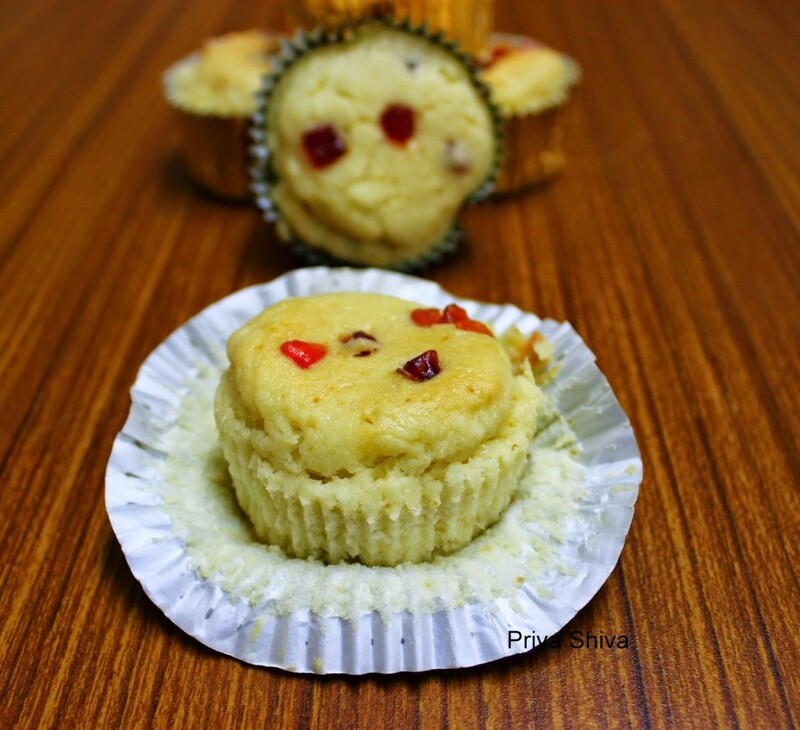 This is one of the easiest muffins you can make as a treat for your kids. They are soft and moist and usually children love tutti frutti.Happy Friday Friends!!!! 1) Preheat Oven at 180 C.
2) Sift all purpose flour, baking powder and keep it aside. 3) Add butter, sugar and vanilla essence in a mixing bowl and mix well till sugar dissolves. 4) Add vinegar and milk and fold. 5) Now add all purpose flour with baking powder slowly to the mix and fold. Do not over mix. The flour must get moistened. 6) Add Tutti frutti and give a quick stir. 7) Grease the muffin cups with some oil evenly or use liners and add the batter to it. Make sure to fill each muffin cup till 3/4 cup and sprinkle some nuts on top. You can replace tutti-frutti with choco-chips, raisins or nuts of your choice. How strange to use vinegar in the muffins. I'm assuming this acts in the same way as an egg. lovely recipe, but do we need to add vinegar? want to try this as it sounds so easy and delightful.. I used milk and vinegar. .you can replace it with curd and baking soda.. This sounds very lovely indeed! You did it again, Priya! You made my mouth water. This looks really good. Thanks!